West Ham are now unbeaten in their last eight Premier League meetings with Crystal Palace. 3 got this spot-on, and another 2 had the outcome. There were 18 who predicted a win for Palace. Championship strugglers Rotherham remain just outside the bottom three after this draw. A massive 9 had this spot-on, and 1 more got the outcome. Doncaster fought back from a goal down to beat 10-man Peterborough in a battle of former managers. Only 2 got this spot-on, but 18 did have the outcome, with 12 going for a 2-1 in what was the weeks most predicted score. Scunthorpe have now lost just once in their last eight games, as they beat an Accrington team who have failed to score in their last six games. 5 had this spot-on, and a further 15 got the outcome. John Askey's first match as Port Vale boss ended in defeat as David Amoo's strike earned Cambridge a win. A massive 10 got this spot-on, with another 14 having the outcome. Jamie Devitt's late free-kick earned Carlisle a draw against their League Two promotion rivals. 5 had this spot-on, and 2 more got the outcome. The resurgent U's were so dominant the visitors didn't manage one shot in 90 minutes. 5 got this spot-on, and a further 21 had the outcome. What a difference a week makes in football predicting. After last week produced a solitary 3 pointer, we came back with a bang this week, with 39 spot-ons equaling the best of the season for them. But that was a 10 game week in Week 10, so to do it in 7 games was a magnificent effort. We had three games ending in the ever popular 1-1, and the other four games were home wins for well supported teams, so we had a recipe for good point scoring, and so it proved. 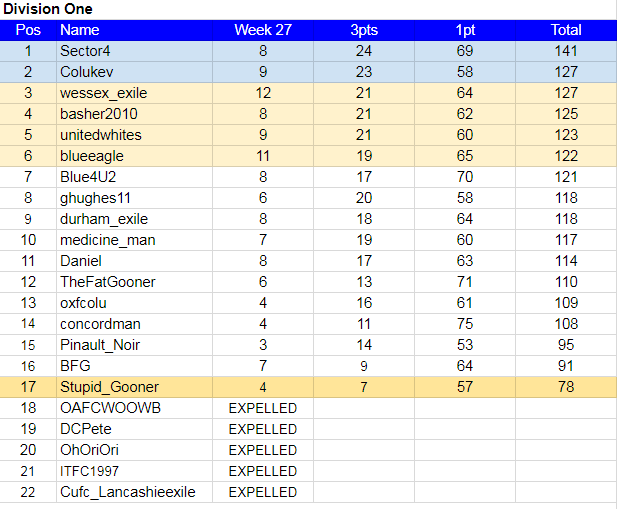 So good in fact there were 11 members who managed to have two 3 pointers each, but even they were upstaged by wessex_exile who had three, the Scunthorpe 2-0, Colchester 3-0 and the Rotherham 1-1, and with three outcomes he is this weeks top scorer with a brilliant 12 points. Also with three spot-ons was blueeagle, the Cambridge 1-0 and the 1-1 draws at Rotherham and Carlisle, on his way to an excellent 11 points. Best of those to have two 3 pointers were burnsieespana, who had the Rotherham 1-1 and the Cambridge 1-0, and Tropical_Us, who had the Palace 1-1, and the Scunthorpe 2-0, as they both got a superb 10 points. It is the Happy Cup semi-finals this week, and I noticed the four participants have already posted their predictions. So well done to them as the deadline is Friday, and I wouldn't want anyone missing that deadline. A reminder to the 12 members who qualified for the Champions League that the competition starts again again next Tuesday. All details can be found on the separate Champions League thread. In the Premier The top two both had the Cambridge 1-0 spot-on, but sevebalo has his lead reduced again as noah4x4 gets one more outcome than him. Back up into the final Charity Shield spot again is Tropical_Us, after his superb week takes him up a couple of places. A good week for gerry_us, with two spot-ons, only moves him up a place, but more importantly a lot closer to the top three. At the bottom the superb effort from burnsieespana has given him a bit of daylight from the bottom two. In Division One Another good week for Sector4 with two 3 pointers keeps him well on course for instant return to the Premier. The competition for the other automatic place is really hotting up, and it took a decent week from Colukev, that included having two spot-ons, for him to maintain that spot. But it is only on the most 3 pointer rule from wessex_exile, who continued his recent red hot form with a top scoring effort this week. Two 3 pointers also for basher2010, unitedwhites and Blue4U2 keeps them well in contention for an auto spot. Though the latter drops out of the play-off places, as the excellent week from blueeagle replaces him there. Good weeks for durham_exile, medicine_man and Daniel, that included having two spot-ons, made sure they all kept the play-off places in their sights. Finally after failing to post for the fourth week in-a-row OAFCWOOWB became the fifth member to be expelled this season. Week 28 Fixtures It is FA Cup 5th Round weekend, but those fixtures are for the Happy Cup, and we have 10 League games picked by this weeks guest TheFatGooner.